Ian Campbell is an avid runner and likes nothing more than going out for a long run to explore in snow, rain or sunshine. Just being out on the trails and mountains does it. Can you break David Ross‘ s course record of 3:48? If so, then you will earn yourself £50 plus £50 for 1st place in this years Croydon Ultra. nb : if more than one person breaks the course record, prize money is only for the fastest person. 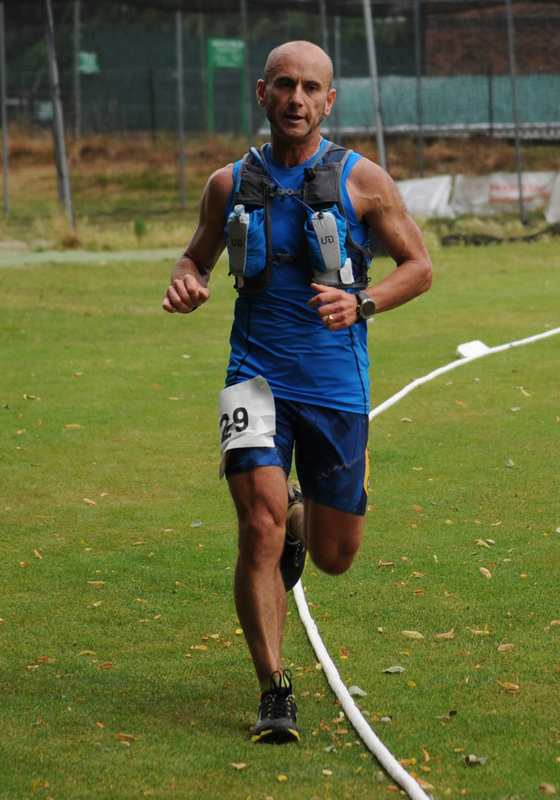 Congratulations to David Ross (2nd place), Jeremy Isaac (3rd place) and Peter Bowles (10th place) on massive efforts at the Centurion Running North Downs Way 100 this weekend. You were all inspiring in your own individual ways, whether you ran, helped, took photos or donated money …… thank you! Here are some photos from the day for you to use and enjoy. The 2014 Croydon Ultra 30 mile race took place today in drizzly but warm conditions. David Ross took out the win and a new course record in 3:48. The women’s race was won by Alice Addison in a time of 4:31 and a new women’s course record and placing 7th overall. Over an undulating first five miles the 48 starters had firm footing and the pace could quicken along the country road sections for the first fifteen mile lap. With checkpoints at every 7.5 miles the runners were able to take on board much needed food and hydration as the rain went away and was replaced by warm cloudy conditions. David Ross with a quick checkpoint stop at 15 miles sped on and from there extended his lead and finished strongly in 3:48. Robert Kirby who was in the lead pack from the start also finished under 4 hours in 3:55. 100 marathon club stalwart Peter Bowles finished third in 4:19. 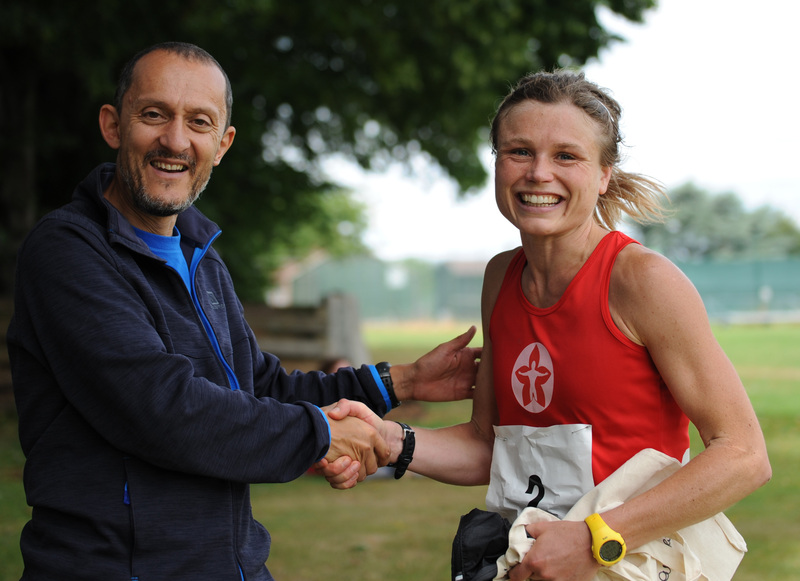 The women’s race was won by Alice Addison finishing strongly in 4:31. Next home was Emma Ferry in 4:47 and third place Brigid Browne in 5:03. We hope you are all looking forward to the Croydon Ultra this Sunday. Its our 4th year of putting on this event and it is steadily growing. As with last year, all funds raised are going to support Parkinson’s UK. Due to some logistical issues we have had to make the decision to reroute the course. So instead of a figure of eight it’s going to be two laps of the first 15 mile section. This will in no way detract from your enjoyment of a 30 mile Ultra, in fact you get the chance to run the trails of the Vanguard Way twice!!! As it is going to be hot on Sunday you maybe really thankful of the chance to run under cover in the woods. Prizes – not only will all entrants get the ‘Croydon Ultra’ cloth bag. medal and goodies – there are a couple of cloth bags specifically waiting for the first man & first women. These have been signed by some elite ultra runners, namely: – Rory Bosio, Mike Foote and Francesca Canepa. Not only that but we have some ‘The North Face’ products to give away as prizes. The start will be at Sandilands and takes the Vanguard Way route plus some quiet country roads to The White Bear in Warlingham. (Fairchildes Rd, Warlingham, Surrey CR6 9PH). Then down Featherbed Lane via Spout Hill, Spring Park and back to Sandilands. That’s 15 miles. Another loop gets you to 30 miles. Croydon Ultra Route Description 2014.